A new White House tell-all from journalist Bob Woodward, the election season's most-talked-about political book, officially went on sale Tuesday as several former aides of President Donald Trump sought to distance themselves from the depiction of a chaotic West Wing. WASHINGTON (AP) — A new White House tell-all from journalist Bob Woodward, the election season’s most-talked-about political book, officially went on sale Tuesday as several former aides of President Donald Trump sought to distance themselves from the depiction of a chaotic West Wing. Former White House staff secretary Rob Porter and onetime economic adviser Gary Cohn both pushed back against “Fear,” which portrays a White House mired in dysfunction, with aides disparaging the Republican president and working to prevent him from making disastrous decisions. Woodward, a longtime Washington Post reporter, has staunchly defended his work in an extensive media tour. The book reached stores on Tuesday and has been No. 1 on Amazon since details first began emerging a week ago. Publisher Simon & Schuster announced that 1 million copies will be printed, though even Amazon, the nation’s biggest book retailer, couldn’t keep up with demand. 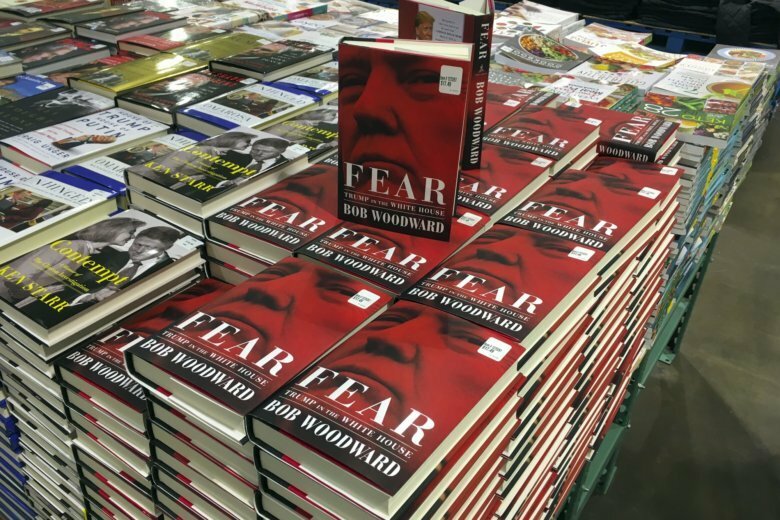 Amazon said Tuesday that Woodward’s book was out of stock and would be available to ship in one to three weeks. Among the revelations in the book: Cohn once removed a document from the president’s desk that would have ended a trade deal with South Korea.